My Mini Moth Mystery Takes a Somewhat Sinister Turn! After writing about the moths that congregate at the light on the trailer where I work, it occurred to me that I hadn’t tried to identify the moths that I was seeing. I turned to the best moth ID resource I know of (at least if you have photos): Facebook! The Facebook group “Moths of the eastern United States” includes several expert moth identifiers and I’ve never had to wait for more than a few minutes to get an answer to my moth queries. So, I posted my moth photo on the group page, and voila! 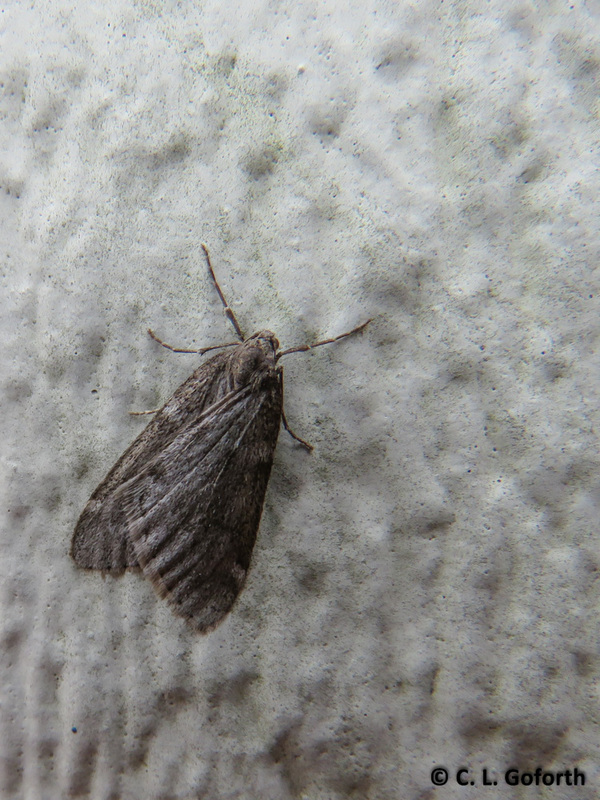 A few minutes later I had and ID for my moth: male fall cankerworm. Hmm… That wasn’t quite what I was hoping for and I was a little disappointed, at least at first. If you’re not familiar with fall cankerworms, allow me to enlighten you! 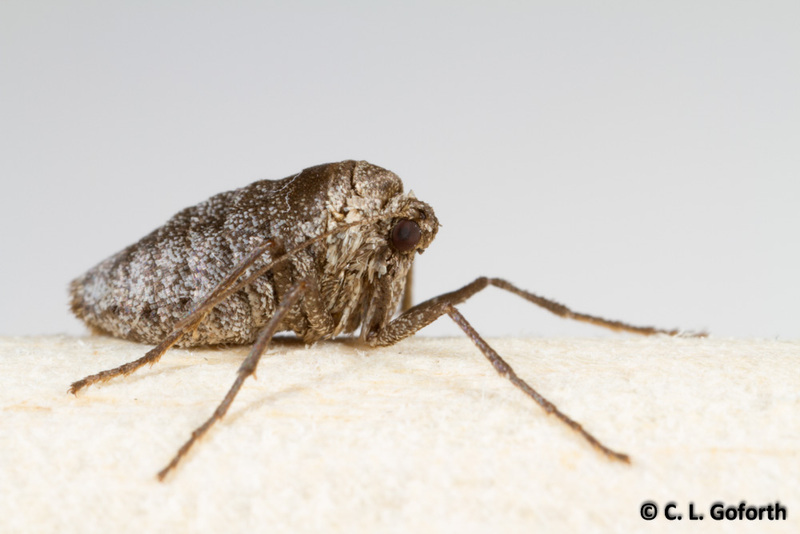 They’re native to the eastern US, but they are considered pests of elms, ashes, and maples (as well as several other trees) and are known to periodically defoliate large stands of trees. In certain parts of the country, they cause huge problems. In my own state, North Carolina, the population in the Charlotte area has been particularly problematic and a state approved aerial application of Bt pesticides has been put into effect in the area. Bt is derived from a biological source, the bacteria Bacillus thuringiensis, and rather specifically targets caterpillars of butterflies and moths. By using Bt during the early spring when pretty much only the caterpillars of the fall cankerworm are active, cities or forest managers can target the cankerworm caterpillars without harming most of the other species in the area. So my little moths are a pest species! I was hoping they were some sort of amazingly well adapted winter moths with a really interesting life history. And they are! Fall cankerworms might be pests, but they’re very interesting pests, so they’re still terribly exciting. Female fall cankerworms are wingless and quite a bit smaller than the males, so they look completely different. In fact, if you look on BugGuide.net at the images of female fall cankerworms, you’ll see that a lot of people who submitted photos of them had no idea what they were. The females still have scales, which implies they’re a butterfly or moth, but the lack of wings really throws people. I’ll admit that when I found the female in the image above when I went into work yesterday, I thought it was a leafhopper for a moment – and I had even read up on cankerworms the day before! It’s really not obvious they’re moths on first glance. Both male and female cankerworms are active in the late fall and early winter, which explains why I’ve been seeing so many of them recently. The females climb way up into the trees to lay their eggs. Presumably the adults die at some point in the winter, then the eggs hatch in early spring. The adults are one of the last insect species active in the winter and the caterpillars are one of the first species to show up in the spring, so they apparently specialize on tolerating cooler weather. The caterpillars are standard inchworm type caterpillars and feed on tree leaves. They can cause some significant damage to the year’s early leaf crop, though rarely kill the trees they feed on. They eventually lower themselves down onto the ground via a silken thread (I often see inchworms dangling from silk on trees here in the spring – now I’ll be looking to see if they’re cankerworms! ), then pupate for several months in the soil. The new adults emerge in the fall and the whole process starts over! What this all means is that my boring looking little gray moths are actually pretty interesting. You’re most likely to see them (as adults or caterpillars) in the colder months, which is strange for an insect. Wingless female moths are always cool too! And the fact that they’re a native pest species means that I probably don’t have to worry too much about them becoming a problem at the field station. I do wonder if we might have a bit of leaf damage this year given that I’ve seen so many more adults than usual. It will be interesting to see if we see a change in canopy density compared to last year as we continue to monitor the phenology of our trees for the National Phenology Network’s citizen science project, Nature’s Notebook. I’ll certainly be on the lookout for those dangling inchworms in the spring as well! If we get enough cold weather this winter you will hopefully see less of them in the spring. It’s minus 6F in Columbus, OH as I write this. The way people in Raleigh talk about it, you’d think that today is the coldest it’s ever been. The next county over even canceled school today because of the cold – it was going to be a high of 26 and that’s apparently too cold for local children to attend school in their heated buildings… However, it really doesn’t get that cold here very often. Heck, I rarely even have to scrape frost off my windows! I’d be surprised if the numbers of moths were significantly impacted by the few very cold days we get each winter. It was 72 degrees here a few days ago! It will get back up into the 50’s soon. But we’ll see! Maybe we’ll get a ton, maybe not. It will be interesting to see what happens! Evil moths? Uh-oh. I hope you are not in danger now that you’ve identified them! I doubt it! They’ve been in the area for ages, so it’s not like they’re a new pest, or an invasive species. They come and go and some years cause damage while they don’t make a difference at all other years. For whatever reason, there seem to be a lot this year, which may come to nothing or may mean that a lot of trees will have fewer leaves next year. Will have to wait and see! Maybe she needs to post a few of those jumping spiders around the edge of her desk to protect her! Ha ha! I love the idea of having jumping spider sentries protecting me! Thank once again, for your obvious drive to learn more about even the most mundane appearing items that show up in our lives. The follow-up is most appreciated… And inspirational, to those of us who so often might just think ‘why that is such a boring looking little brown-gray moth, how stupid of it to be out here when it’s too cold to do anything moth-like.’ kudoes! This is such an amazing compliment – thank you! I wish I could know everything about everything, but alas that is impossible. All I can do is look around at things, wonder what’s going on, and try to figure it out. If the knowledge I seek doesn’t exist, even better! That’s what being a scientist is all about – satisfying your curiosity. Plus, as you can probably tell, I am ridiculously easy to entertain and notice a lot of really random, seemingly insignificant things. I’m just glad that other people sometimes find them interesting too! You are getting your groove back. Good stuff. Thanks so much! I’m happy to be blogging more and I’m making it more of a priority in my life again. I missed it!